For as long as I can remember, I’ve always had lots of books. So much so that my mother, when I was about 10, actually went to our local library to put a limit on the number that I could borrow at once. Mr Garlic and I have agreed that whilst we won’t spoil the GarlicBaby, we will always allow him to have lots of books. Whilst we were at Hampton Court, I found a new addition to my gardening library, Adam the Gardener . 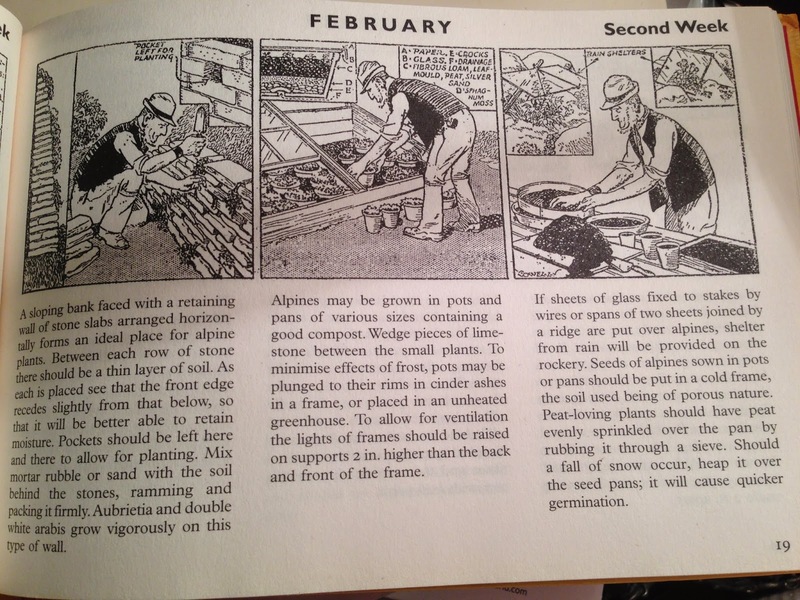 It’s a marvellous pictoral week-by-week guide to gardening, made of a collection of cartoons originally published in the Sunday Express in the 1940s. It’s a rather lovely depiction of tasks that should be completed on a weekly basis and shows a surprising amount of detail. The grumpy gardener, Adam himself bustles about in what looks like a rather fetching panama hat and (Mr Garlic would approve) is so manly that he doesn’t wear a coat even in the depths of winter. It’s really quite inspiring (I feel rather chastised by his serious points about strawberries in this week’s cartoon). Rating: 5/5 – This is a lovely little book that would make a great present (especially stocking filler) for any keen gardener. It’s not only an amusing read, it’s a useful reference book that you can dip into every week to get ideas about what you should be up to. A really nice little collection.